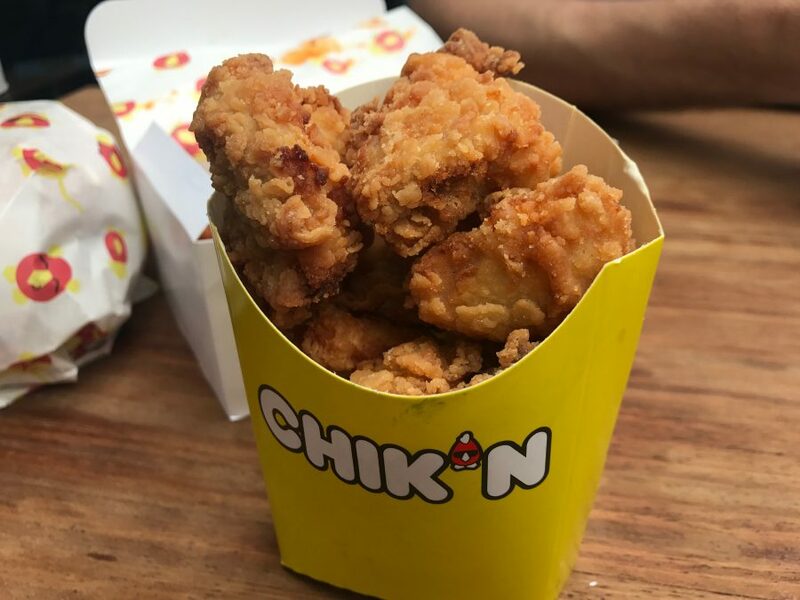 Carle Clarke and David Wolanski, owners of Chick ‘n’ Sours in Dalston and Seven Dials, certainly have a hit on their hands with their latest opening Chik’N. You can best sum it up with the words free-range, fast-food and bloody-delicious. Essentially it’s more of what they do best: fried chicken. It sits on Baker Street, ironically right next to a KFC, and on our Sunday afternoon visit it’s fairly quiet. Be warned: midweek lunch and dinner times see huge queues. 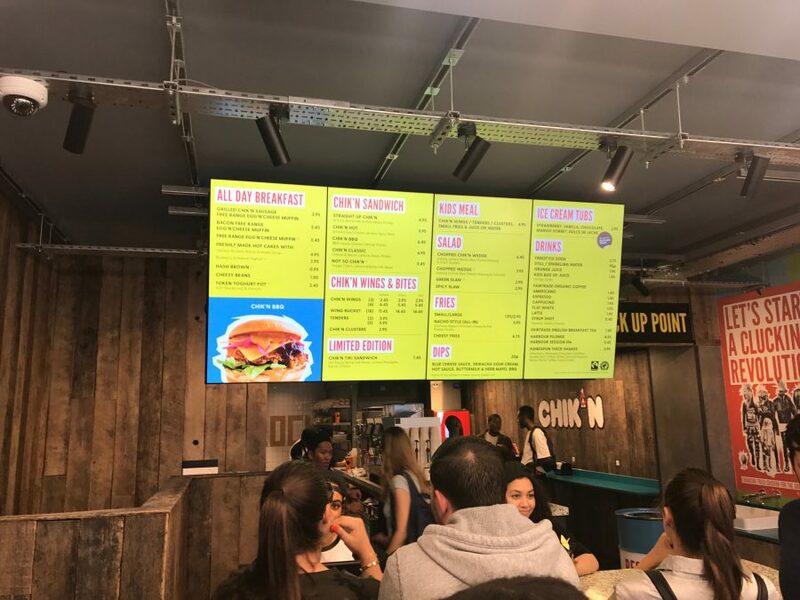 We order at the counter with the menu on screens above our heads. It’s a predominately takeaway offering with a few tables in the front. 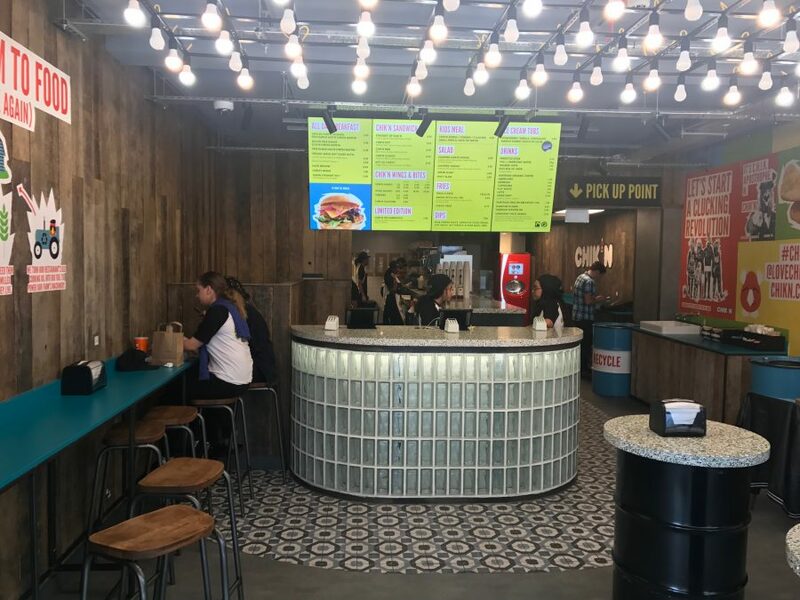 The decor is fun and colourful, the wooden walls are plastered with Chik’N posters. Servers are friendly and enthusiastic. 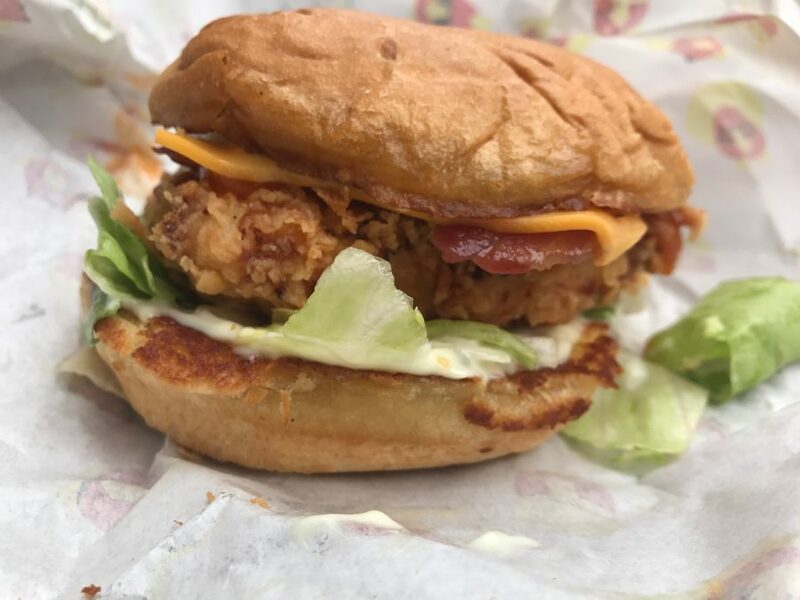 We order a Chik’N classic sandwich but we’re given the limited edition tiki sandwich (£7.45) instead. No bother as it’s lush. The fried chicken is some of the best you’ll find – the batter is insanely crispy, even though covered in hot sauce AND buttermilk mayo. There’s bacon, American cheese and even a slice of pineapple which is a brilliant addition; sweet and salty heaven. 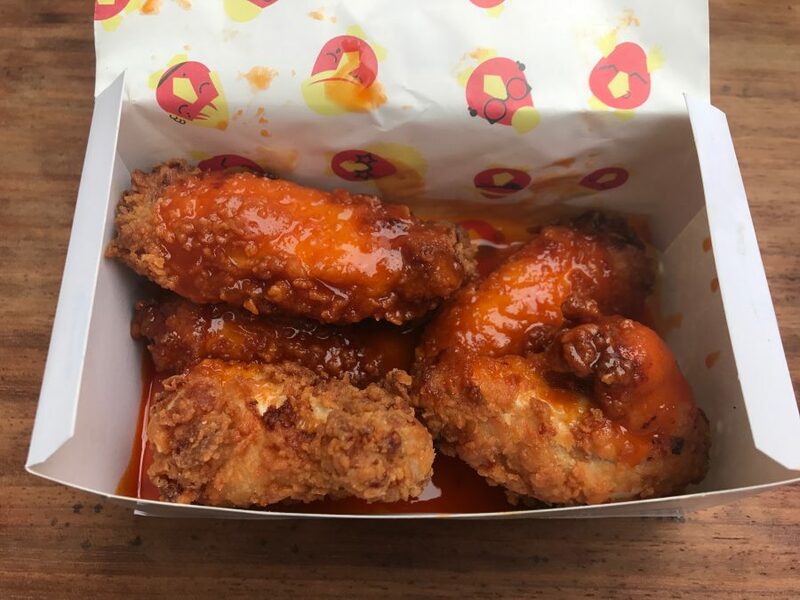 Wings (£5.45 for 6) also retain their crunch while being coated in the Chik’N hot sauce – I have no idea how they do it. The sauce, all fiery and tangy, is worryingly addictive. Homemade too, so not full of e numbers. Chik’N clusters (£2.95) come without sauce but you can buy dips like blue cheese and Sriracha sour cream separately. Basically, KFC’s popcorn chicken but ten times better. Nacho fries (£5.95) is a meal in itself. 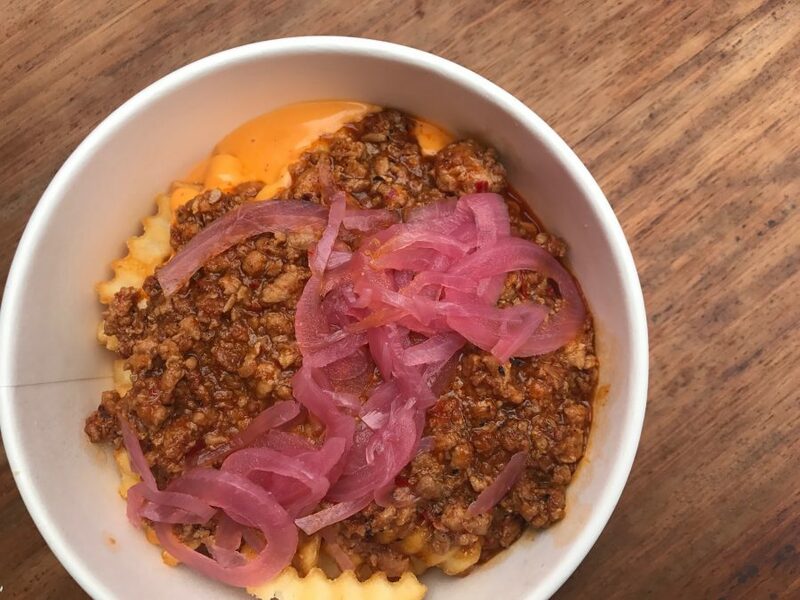 Crinkly cut fries topped with szechuan ragout and kimchi cheese turn into a big bowl of soggy, stodgy loveliness – proper comfort food. We wash it down with refillable Coke from one of those machines that gives you 4,000 different flavour options. My guilty secret as a “foodie” has always been a love of KFC. The sights and sounds of the Old Kent Road drive thru hold a special place in my heart. But ethically it makes me a terrible person. So now Chik’N has opened, you’ll find me there, tucking into free range fried bird, like the angel I am. I’ve found my new happy place.